Peoria Assn. Of Pastors For Community & Spiritual Renewal: Calling All Fathers And Families. Father's Day Anti-Violence Rally! Calling All Fathers And Families. Father's Day Anti-Violence Rally! 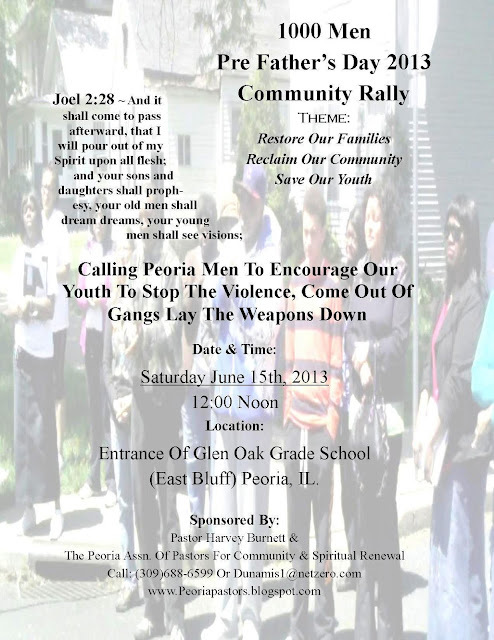 As promised the Peoria Association of Pastors is calling out to all Fathers for a pre-Father's day anti-violence community rally. 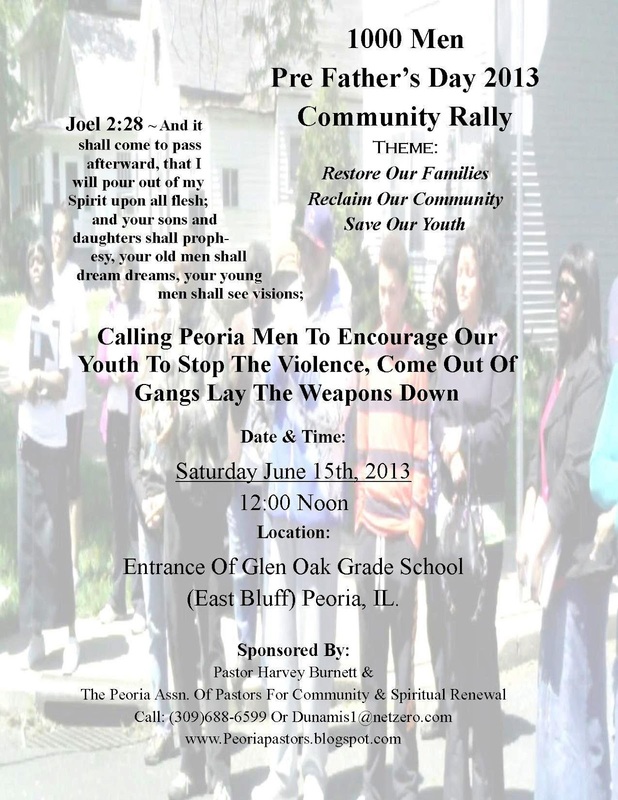 We will meet for the street and community styled rally at the entrance of Glen Oak Grade School on Saturday June 15th, 2013 at 12:00 noon. Men woman and children are invited. Men's groups are welcome to represent themselves. We want to take the opportunity to invite men to compel their sons, daughters and neighbors to stop the violence, come out of the streets and embark upon a better path in life. The Mothers left a MESSAGE and we will ask the Fathers to formulate and leave one as well. For additional information please call (309)688-6599 or email Dunamis1@netzero.com. We would also like the father's to produce a 10 point message that we can deliver to the youth. This will be combined with the 10 point message that the Mother's delivered to the youth and community during the pre-Mother's day rally. We need your help and participation. You are welcomed to be a part and contribute. Thank you.